I bought enough Batiks for my stash and some Civil War fabrics. I went home afterwards. I decided to stop at a small antique shop in Newberg that is next door to the Library. I ended up finding the cutest little sewing machine. 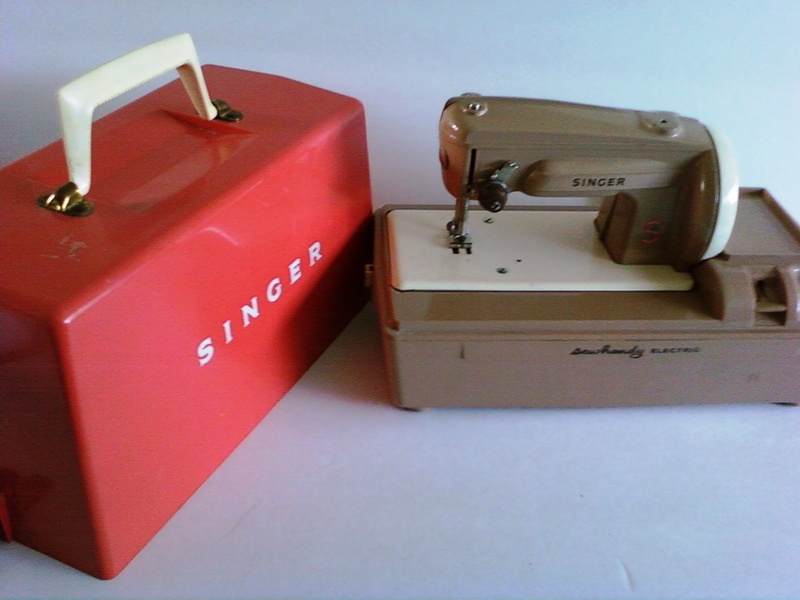 It is called a "Singer Handy Electric." I paid $17.21 for it. I need to get needles and a thread holder on top. I took it apart and made sure it was clean. I plugged it in and it does run. I have since printed a manual for it. Now for the 2 parts and I am off. My friends laugh because it is either #12 , 13 or 14 machines I have. My daughter Shay, just shakes her head. I have resisted garage sales because I know there are lonely machines out there calling me. On another note. I took some UFOs to my group last night and we counted 14. This is just a small amount, I know there has to be at least 10+ more here. I am going to start listing them here and crossing them off as I get them done. First on my list are the 2 round robins. I love this machine esp the red case...Can't wait to see your first project made on it.